After an eventful year, I took some time off in 2014 over Christmas to visit home. These visits are ostensibly vacations but are in reality rushed affairs. Who merits visits? This aunt, that uncle, that branch of cousins third removed? Travels are exhausting and needs one leaving a second break after a visit home. I dislike photographing a lot when I am in India preferring to loaf around towns and cities inconspicuously,as in the past. The camera brings me too much back to the present with its worries and urgent demands of attention. The lack of a camera almost sets me free. However, there are those occasional regrets about opportunities missed. This particular trip , I took two sets of photos, one from my maternal ancestral village, the fist time I had been there since I lost both my grandparents. The village itself is quite remote, so much so that I remember the first time they got roads and electricity. Once we got there, first order of business was to visit the family temple. I got some good pictures there. After, we visited my grandparents now abandoned home. The grounds were overrun with weeds but the Hibiscus was in full bloom with the Jackfruit hanging heavy on the tree. There were some coconuts from the mature trees that my grandparents maid had set aside when she heard I would be coming to visit. Apparently, the house was infested with termites and a large number of my grandparents possessions had to be burned in the yard to prevent it from spreading. Amongs’t the characteristic red soil that had been heaped on burning embers, I found the chess pieces from the set on which my grandfather taught me how to play. The memory of how he refused to play me after I beat him for the first time brought a smile to my lips. After my visit to my maternal village, I just got a quick photo at my paternal grandfathers Village, Mankombu, a waterlogged paddy cultivating powerhouse in years gone by. See if you can spot which one it is. After my meanderings in the south of India, I traveled to Kolkata (erstwhile Culcutta) in the east to attend the wedding of S getting married to R. A, a dear friend and future roommate graciously hosted me and showed me around the city.The city was as chaotic and unclean as it was reputed to be. The people and businesses there had a laidback approach which I found very uncharacteristic of any other city in India. 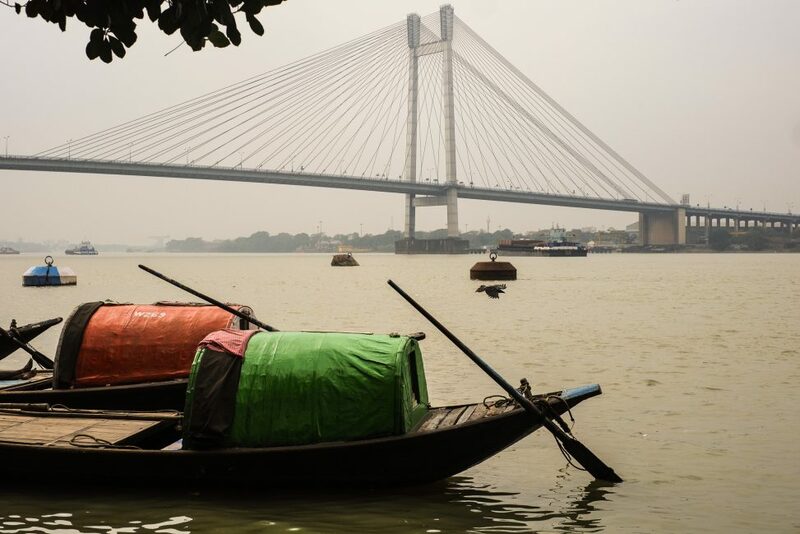 There, I took some images from the Iconic Vidyasagar Setu (the longest cable stayed bridge in India) on the Hooghly river. Kolkata being the capital of the Bengal Presidency during the days of empire, Colonial architecture was in abundant display, nowhere moreso than at the Victoria Memorial,of which I have a few pictures. The wedding and party post the wedding was memorable and continued late in the wee hours of the next day. After a day recuperating, I went to Chennai to spend some time with my sister and brother-in-law. Being in Chennai reminded me of how odd Kolkata was and what variety could be found within the great nation of India, capable of surprising even its own. I flew to TH to visit J from Chennai but that is the subject of another post.